Looking for a great Canada Day party this year? 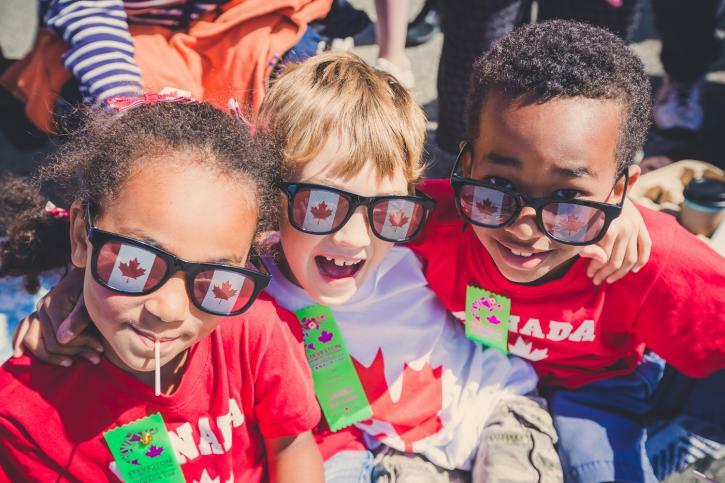 Preparations are being fine-tuned for Richmond’s massive July 1 celebrations—and Steveston is once again the centre of the main maple leaf-wrapped shenanigans. But what do you need to know before digging out your red pants, grabbing a couple of hand-held mini flags and painting your face with lines from O Canada? 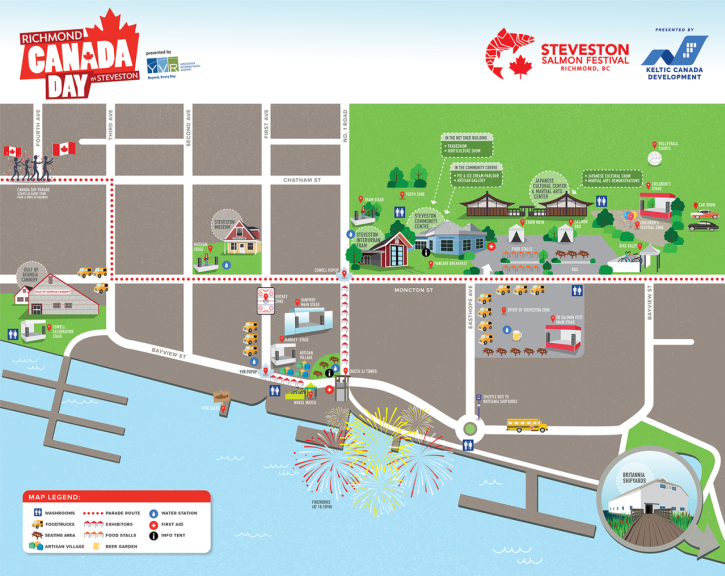 Read on for our insider’s guide to planning the perfect Canada Day visit to Steveston. It depends what you want to see and do! If you want to make a really full day of it, get there for the Pancake Breakfast (served starting from 6:30am). It’s part of the Steveston Salmon Festival, the huge community celebration that runs alongside the Richmond Canada Day party here every year. After that, there’s a full menu of events and activities, concluding with a grand fireworks display at 10:15pm. One of the day’s must-see highlights, though, is the Canada Day Parade, running from 10am to around noon from Garry Point Park, down Third Avenue and along Moncton Street. Arrive early for the perfect viewing spot! Tell me more about the parade? 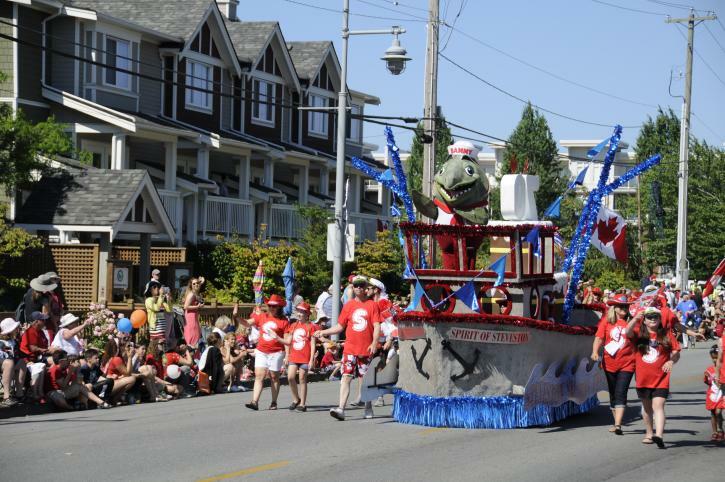 Metro Vancouver’s biggest Canada Day street parade is a smile-triggering cavalcade of decorated floats, marching bands, vintage vehicles and—of course—a hotly-anticipated appearance from Steveston’s Sammy the Salmon mascot. If you’re here early enough, look out for the 9:30am Children’s Bike Parade, which preempts the main parade with its host of grinning local kids riding past on their bicycles. There’s a huge array of accompanying, free-entry events and activities to explore, many of them under the Salmon Festival banner. Look out for the Car Show; Art Show; Japanese Cultural Show; Horticultural Show; Trade Show; martial arts demonstrations; and an artisan market. And if you’re a sports fan, don’t miss the special street hockey tournament, where kids will have the chance to be crowned the Steveston Cup champions in divisions for ages 9-17. You can wander the village and discover these shows and events for yourself or plan ahead before you arrive. There’s a huge—and entirely free—live music component to Canada Day in Richmond, with eight stages set up throughout the village. The largest is the Vanprop Main Stage, where the day’s biggest acts include Vince Vaccaro, Terra Lightfoot and—from 9:00pm to 10:15pm—headliner Big Sugar, the Juno award-winning blues and reggae rock act. There are around 50 acts performing on stage throughout the day, including non-musical shows such as jugglers, dancers and a spectacular fire-based act called Illuminaria. You can view the full line up, plus stage locations and performance times, here. 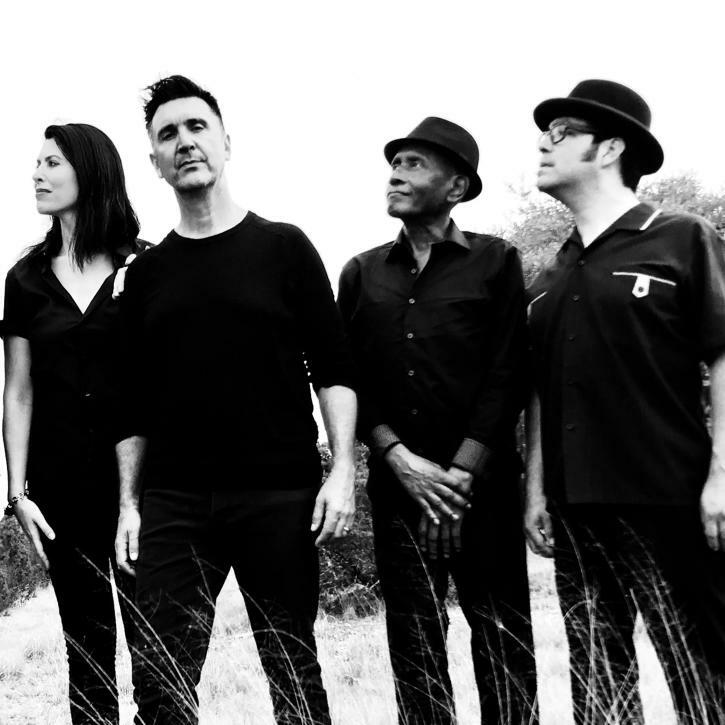 Juno award-winners Big Sugar take the main stage on July 1st. You’ll find it hard not to eat here! The highlight of the day is the Salmon Festival’s Salmon Bake. It runs from 10:00am until supplies run out, serves-up more than 1,200 pounds of barbecued wild salmon, and costs $16 per plate; arrive early to avoid the crush! There will also be food trucks dotted around the village, including a cluster across the street from the Steveston Community Centre. In addition, Steveston has a full menu of excellent restaurants and cafes to dive into. Will there be anywhere to get out of the sun—or take a breather from the crowds? The Steveston Museum, Gulf of Georgia Cannery National Historic Site and Britannia Shipyards National Historic Site will all be open on the big day—and don’t miss the chance to visit the Interurban Tram building if you haven’t already. If you need a breather, head to Garry Point Park and find a restorative spot to sit down on the grass. Are there going to be any fireworks? Don’t miss the 10:15pm Canada Day fireworks display, a 15-minute pyrotechnic feast launched over the Fraser River shoreline. It’s the perfect way to end your day and raise a few final July 1 cheers for Canada’s big birthday! Try to avoid driving. The roads around Steveston will be full and some will be closed on the day. Parking will also be extremely limited. It’s far better to make alternative arrangements. Free Steveston-bound shuttle buses will run throughout the day from Richmond City Hall and Lord Byng Elementary School. TransLink Canada Line services can also whiz you to Richmond-Brighouse Station, where you can board one of several transit bus services running straight to Steveston. There are also some great cycling routes if you need to earn some calorie space for you salmon feast—there will be free and secure bike valet areas at the event. Click here for detailed Richmond Canada Day transportation tips. 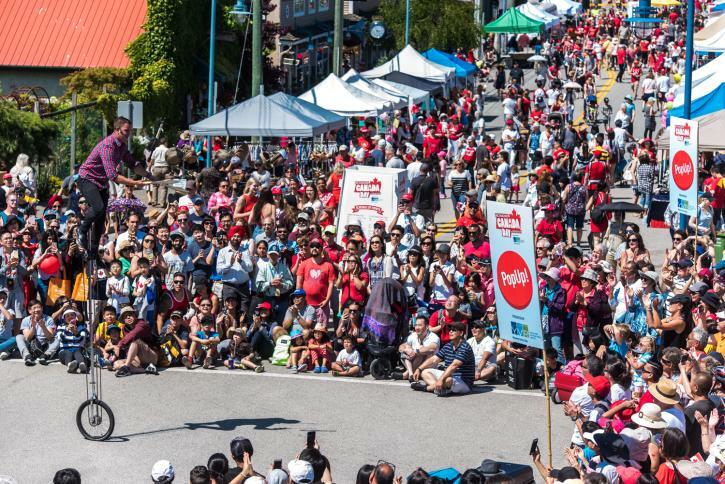 Richmond Canada Day is happening in conjunction with the Steveston Salmon Festival in Steveston.